There’s nothing like wounded vanity to launch a thousand ships of war. And in the name of bruised honor, what’s the sacrifice of numberless mortal souls – or, if the gods see fit, one’s daughter? A man’s got to do what a man’s got to do. That, more or less, is the premise of Euripides’ classical Greek drama “Iphigenia in Aulis,” which one might construe as a very early instance of theater of the absurd. 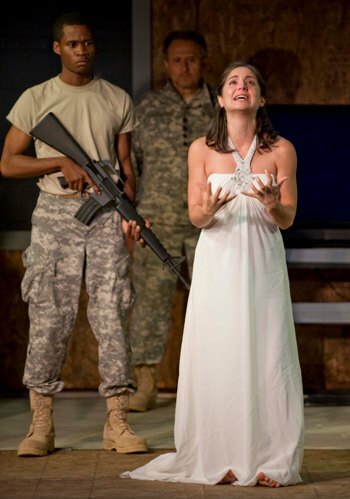 In that wry spirit, and in his characteristic eclectic fashion, playwright Charles Mee has reconstructed Euripides’ play as “Iphigenia 2.0.” Mee’s mordantly witty retelling of the imperishable bad joke that is war now occupies the stage at Next Theatre in a production notable for both its satiric edge and its center of sheer madness. Mee, who prides himself on stirring together the ideas of other writers to create his own vibrant and surprising dramatic stew, has spiced Euripides’ original play with texts by Alan Stuart-Smyth, Jim Graves, Gaby Bashan, Richard Holmes, Richard Heckler, Dave Grossman, Wilfred Own and Anthony Swofford. Yet what unfolds on the stage – certainly in this re-creation under director David Kersnar – hardly gives the impression of a pastiche. It is a concise, searing portrait of war as a maniacal obsession, the reckless indulgence of something deep in the human heart, something dark and needful. The gist of the story in Greek mythology is that royal Agamemnon has embarked with a mighty armada of soldiers toward Troy to retrieve the beautiful Helen, wife of his brother Menelaus. But en route, the fleet stalls at Aulis when an importuned god withholds the winds until Agamemnon has sacrificed his daughter Iphigenia. In Euripides, the general summons his daughter (accompanied by her mother Clytemnestra) to Aulis and accedes to the god’s demand. Playwright Mee spins the situation, making the soldiers the authors of Agamemnon’s predicament: They will not go forward, with certain death awaiting some of them, until Agamemnon makes the very sacrifice he so blithely asks of them. He must take the life of his loved one. But will he? Can he? Up steps Mee’s Menelaus – played here in full flourish of gung-ho, self-righteous posturing by Ricardo Gutierrez – to goad Agamemnon on with a hard-boiled lecture on what real soldiers must sometimes do. As the waffling Agamemnon, Aaron Todd Douglas strikes a credible balance in his agonizing struggle between the love of a father and the duty of a commander. Mee’s message is pretty clear, however. While Agamemnon’s torment appears to be quite understandable, what is it we’re really talking about here? The slaughter of his child will appease the hounds of war thirsting for the arena of boundless mayhem, suffering and death. And for what – the possible retrieval of a woman who perhaps no longer wished to live with her warrior husband? Will all the killing and ruin be for that? The answer is simply yes. Agamemnon’s troops have taken the scent of blood, and they will go to war. 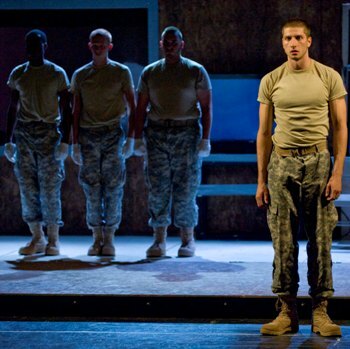 The most compelling element of this staging is the four soldiers who represent Agamemnon’s vast and restless military force. 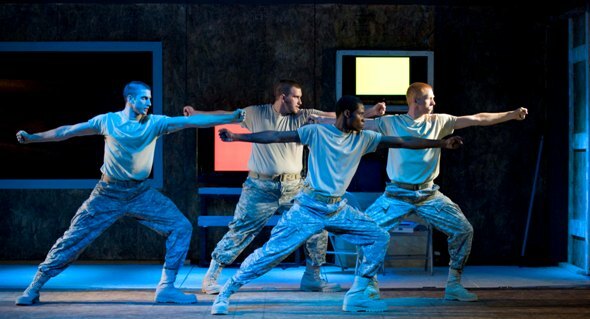 Through crisp, macho choreography and fierce declamations of pride and prowess, Luce Metrius, Wesley Daniel, Erik Strebig and Max Fabian bring the eternal face of war front and center. Meanwhile, Agamemnon lures Iphigenia – bright-eyed and beaming with life in the form of Rebecca Buller – to Aulis on the pretext that she is to marry the greatest of Greek warriors, Achilles. With her comes Clytemnestra (Laura T. Fisher exuding happiness and dispensing wedding etiquette to the bridesmaids). When reality sets in, Iphigenia proves to be her daddy’s girl. Hoo-rah! To say the crowd goes wild is putting it mildly. The inside-the-box set design by Rick and Jackie Penrod perhaps makes its own statement. Not a lot to be said about costume designer Marianna Czaszar’s basic military attire, but I loved the wedding dress. Pure white. For virtue, a quality that flutters in the space between love and war.